Elizabeth Gilbert I love youuuuuuu *Fan girl scream*. 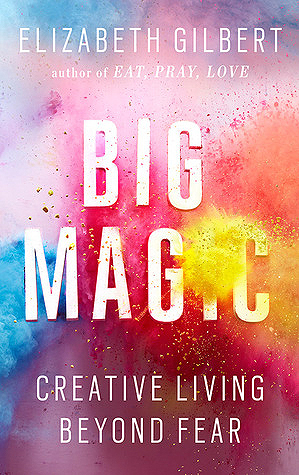 This has got to be one of the best books on creativity I’ve read. Seriously. If you have not read this book I have a few wise words for you – run to your local bookstore and buy it NOW! My copy of this book has been ear tagged the whole way through (and this is coming from a girl that doesn’t condone the ear tagging of books). There are some beautiful and eye opening ideas in this book that really give meaning to the quote “The mind once stretched by a new idea never returns to its original dimensions”. A creative life is an amplified life. It’s a bigger life, a happier life, an expanded life, and a hell of a lot more interesting life. Living in this manner—continually and stubbornly bringing forth the jewels that are hidden within you—is a fine art, in and of itself. And who doesn’t want that? Isn’t this what we’re all really here for? But to yell at your creativity, saying, “You must earn money for me!” is sort of like yelling at a cat; it has no idea what you’re talking about, and all you’re doing is scaring it away, because you’re making really loud noises and your face looks weird when you do that. I urge you to read this book. If there is just one book that you pick up this year, make it this one. It will enchant you, inspire you and open your eyes to a whole new way of thinking about living a creative life. Welcome to a diary of my book reviews, recommendations and inspirational posts. Want to receive notifications of new book reviews by email (and no spam - ever! )?